Future Biogas specialises in the construction and operation of biogas plants for the UK. Its plants operate on a range of locally sourced biomass feedstocks, generating clean, renewable and reliable energy. It has an experienced team which has unique and in-depth knowledge of biogas production. 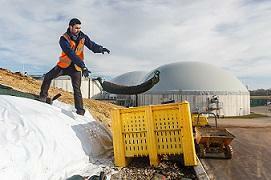 Future Biogas has ten anaerobic digestion plants. The site pictured is Oak Grove in Coltishall, Norfolk. It is a 2.2mw electrical connection plant, which uses 44-thousand tonnes of feedstock annually. • The feedstock is held in silage clamps and used to feed the anaerobic digestion process every day. • This produces biogas which contains methane and carbon dioxide. The methane in the biogas is then used to drive an engine which in turn turns a generator and produces electricity. • The anaerobic digestion by-product is digestate. It is a fertiliser and goes back on to the land to grow next year’s crops. • When the feedstock comes to site it is ensiled into silage clamps. It is then sheeted down to start the conditions to preserve it. The Dolavs are used to store the gravel bags which are put on top of the clamps to weight down the sheets. Each site uses approx. 30 to 40 Dolavs for storing gravel bags. 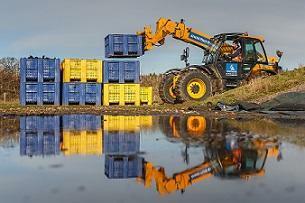 “For our ten sites we chose Dolavs because they are strong, robust, easy to move and very stackable. We have used Dolavs for the last five years. They have stood up to the test of time carrying 700 kilos of stone in bags. We have found the boxes to be very tough. We tend to throw stone bags into them and we can also push them round the site to get them in position and we have had no failures,” said Jon Myhill, Regional Feedstock Manager, Future Biogas.